The first head of cabbage arrived in our CSA and since we had eaten the last of our sauerkraut I knew that this small head was destined to be fermented. Fermented foods are so good for your gut and health. It is so easy to make sauerkraut. You only need 2 ingredients cabbage and salt. I buy course Celtic sea salt from the health food store. You will also need a stainless steel bowl, a couple of quart canning jars with lids, and a stomper. For the stomper you can use just a piece of two by two wood cut about a foot long or so or you can purchase one, there are several available on Amazon. Use new wood and sterilize it in boiling water. If you want you can shave the corners off on one end to round it out a bit so it will be more comfortable for your hand. The trick is all in the method. Below is the traditional method but keep reading because I'll also give you my lazy method. 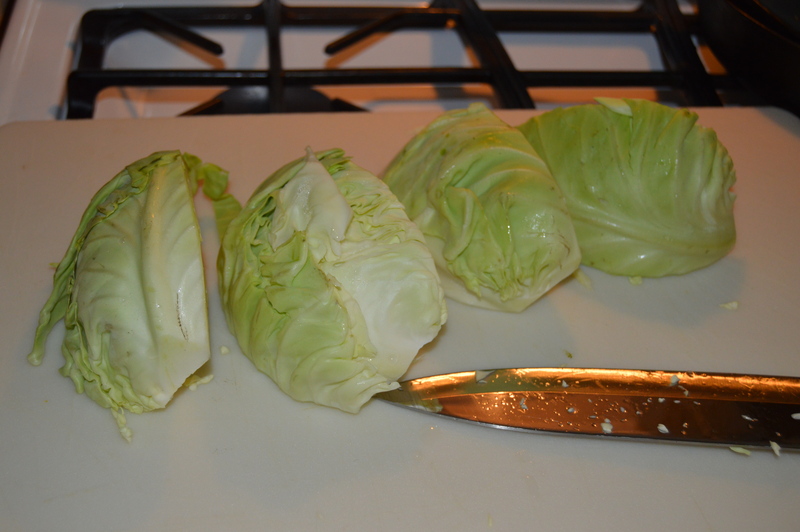 Cut the cabbage in quarters then remove the stem from each quarter. 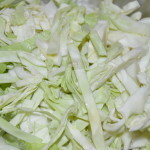 Cut the cabbage into thin shreds. Put the cabbage in the stainless steel bowl. Now sprinkle about 1 tablespoon of the sea salt onto the cabbage in the bowl. Use a little less if it is a small head of cabbage or maybe a little more if it is really large. Now you will proceed to stomp or smash the salt into the cabbage with your wood or stomper in a up down motion. You need to continue to do this until you produce enough liquid in the bottom of the bowl, about a half pint or maybe a little more. There must be enough that when the cabbage is pushed down into the canning jars the liquid will cover all the cabbage. 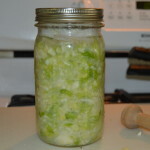 Once you feel you have enough liquid take your clean sterilized canning jars and begin to put the cabbage into the jars. As you put the cabbage into the jars use your stomper to press the cabbage into the jar. You want it very compacted into the jars and as you do this the juice will squeeze to the top. This is good. Completely fill one jar before you start on the other. Depending on the size of you cabbage you may only get one jar. Once all the cabbage is in the jar(s) and really pressed down add the remainder of the liquid so that the cabbage is completely submerged. The trick to good fermentation is not to let any of the cabbage rise out of the water. Leave the jars on the counter out of direct sunlight and let things happen. Every morning and evening you need to check you sauerkraut. Open the lid to release any pressure built up and check to make sure the cabbage is still under the liquid. I use the back of a spoon and just press it down into the liquid each day to make sure. If it gets out of the liquid for too long it will get dry or could even mold. After about a week take a taste. It takes different lengths of time to ferment depending on the temperature of the room it is fermenting in. Taste it every few days after that until it is at the point that you like it. Then put it in the refrigerator and enjoy. It will last for several weeks or longer when refrigerated. Now as you know I'm pretty busy with everything around the homestead so I have devised a quicker way to get the liquid to come out of the cabbage. The disadvantage to this is that the pieces of cabbage end up broken into smaller pieces but there is no change in health benefits or taste. I use my Kitchen Aid mixer to "pound" my cabbage. The stainless steel bowl I use is the one that goes to my mixer and my pounder is the paddle for the mixer. Now when you first lower the paddle into the bowl full of cabbage it will be a little difficult because the shredded cabbage is so dense. Just push as hard as you can and turn the mixer on low. As the paddle slowly rotates it will reach the bottom of the bowl. I suggest if you have a large cabbage you do this in a couple of batches so you don't have cabbage all over the kitchen. Let the paddle pound the cabbage until you have liquid at the bottom of the bowl. The paddle method does seem to make the liquid foam a bit but when everything is compressed into the jars the bubbles will go away. Next time I am going to try the dough hook to see if that will leave the cabbage in larger pieces and not make the liquid foam as much. I'll let you know. If you don't think you like sauerkraut please try this. 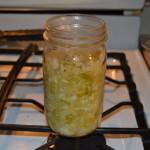 I did not like it but fresh homemade sauerkraut is wonderful and full of great enzymes to keep you feeling good. If you want to know more about fermented foods I love the book The Complete Idiot's Guide to Fermenting Foods by Wardeh Harmon which I bought on Amazon. She also has a website and newsletter that has great information at Traditional Cooking School.